In the depths of winter, adults, as well as children, exert themselves to engage in enjoyable outdoor activities that will keep them warm and provide both excitement and entertainment. Cross-country skiing, downhill skiing, sledding, ice hockey, figure skating, and speed skating all have their enthusiasts. Many people are proficient in multiple winter sports. Others have no discernible degree of skill, yet persist owing to the exhilaration and good feelings that are obtained by asserting oneself in the face of freezing temperatures. Even in Southern California, where the winter temperatures are laughably warm compared to those registered in places where it gets authentically cold, residents feel the bite of winter. Even in warmer areas, children and anyone young at heart can visit ice rinks in neighborhoods malls and get a sense of what it's like to skate on frozen water. 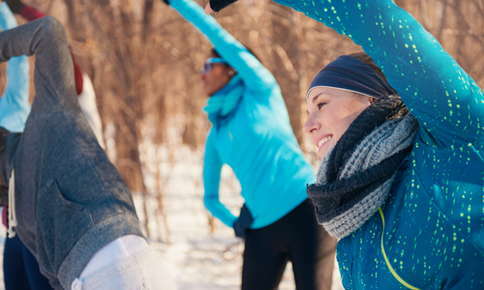 Importantly, participation in winter sports may often lead to injury, owing in large part to the physical momentum involved in skating, skiing, and sledding. Although injuries are often random and result from unfortunate circumstances, we can take many protective measures to help prevent an injury, despite having sustained a hard fall on the ice or a rough tumble downhill. Proper preparation for any winter outdoor activity includes making sure that your body is up to the task. We get ourselves ready for sports-type engagement by participating in regular physical exercise. When we do aerobic exercises, we're training our heart, lungs, and circulatory system to increase their efficiency. Over time, we become better able to breathe more deeply, providing increased amounts of oxygen to power our muscles and other metabolic processes. When we do strength-training exercises, we're developing the ability of our muscles and bones to support and maneuver with increased mechanical loads -- abilities needed for skiing and skating and other winter sports. Additionally, cardiovascular and strength-training exercises enhance the capabilities of our proprioceptive system, a network of nerve endings that help our bodies make instantaneous decisions regarding balance and position in three-dimensional space, subconscious skills that are critical to the successful enjoyment of winter activities. Regular chiropractic care is a key component of our winter sports planning. Regular chiropractic care detects and corrects sources of nerve interference and restores and supports optimal mechanical function of the spinal column, our body's mechanical center. By making sure we are getting regular chiropractic care, we help ourselves get the most out of our exercise programs. In this way, regular chiropractic care helps us stay healthy, avoid injury, and have outdoor fun all winter long.